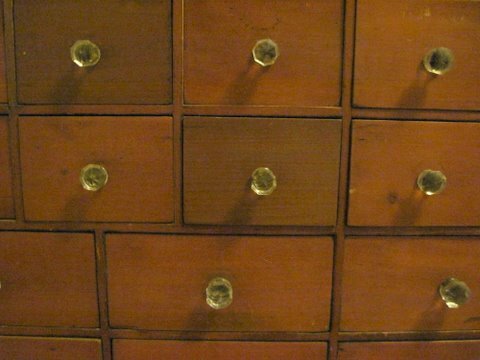 The scarves are kept in an apothecary type chest of small drawers. There are probably over thirty of them, an accumulation over about as many years. They are from all over the world and many of them have been passed on, gifted or inherited by a variety of special people – friends, family, those I lost touch with or those no longer living. 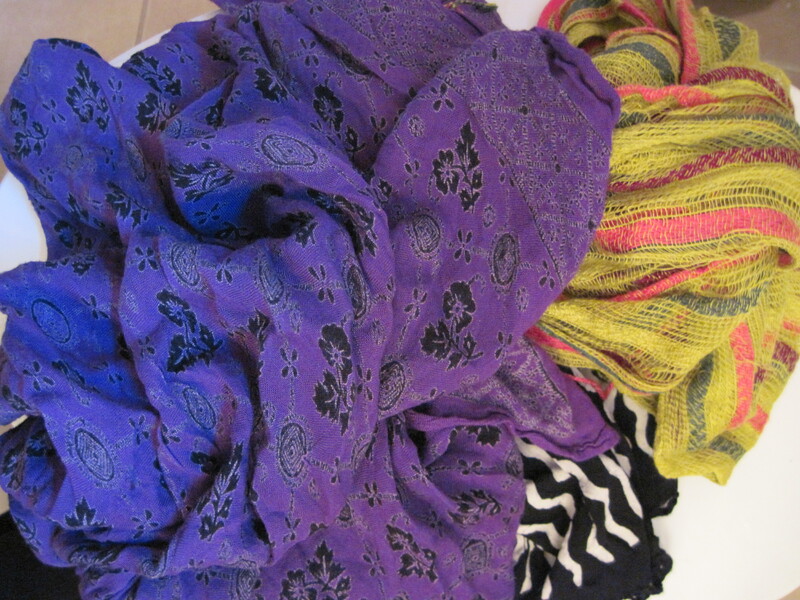 When I wear a particular scarf, I think about that person – I really do think about them. I recall their faces or the occasion, a moment we shared together or a little vignette. It is a nice feeling and something that matters to me. However, it is yet another instance of making connections to “things”, which is a penchant I sometimes obsess over as it conflicts with some of the Buddhist philosophies I struggle with; wanting and enjoying the connections that certain objects can trigger versus letting go of possessions and not having an attachment to the importance of physical items. The other day, a chilly day, I was cruising through the hallway on my way out the door when I grabbed a particular scarf from a drawer, wound it around my neck and headed to our destination, an art exhibit featuring a talented friend, followed by dinner with those friends old and new. The scent of mustiness and magic markers seemed to be coming from everywhere and it didn’t take me long to realize that it was my scarf that smelled a little weird. I was hoping nobody noticed but me and I made a mental note to check the rest of the scarves in those drawers. The very next day after the smelly scarf incident, I went through the other drawers and noted that every single scarf had that same odor. I decided they need to be washed. All required washing by hand. And so, by default, this project became Day Five of The Pack Rat Project (just in case anybody thought I might have abandoned it, it is still going on, albeit slowly). The chest once belonged to my father, a very talented and prolific artist who made a living doing what he loved. Were he still alive, he would have celebrated his eightieth birthday on this very day. The drawers had been filled with a variety of felt tipped pens that he favored for dashing off a doodle, a caricature, a quick sketch on anything within reach, be it a paper napkin or the back of an errand list. There were also some water colors and inks and an assortment of pipes, pipe cleaners and pipe parts – just some of the many items he collected. Now almost all these drawers are stuffed with my scarves of all different fabrics and colors, including some of his own. In the bottom drawers are personal address books that once belonged to my parents, overflowing with the names of friends, the multiple addresses documenting the moves of myself and my siblings crossed out and rewritten down the pages, all held together with rubber bands; more marking pens, a whole lot of empty little cardboard jewelry boxes to use for gifting, and Christmas ornaments that had been found on the tree after the ornament box was put back up into the attic last winter. There is seriously a Collecting Gene (the polite word for Pack Rat Gene) running through this family. I removed the markers and freshened each drawer with with essential oils. I put aside a couple of the scarves for my daughters. Although the address books are partially filled with names of others who must be long departed, I cannot part with them, at least not now. Maybe I will pass on some of these ornaments to the kids. Maybe I should make some earrings to go into those little boxes. So much to do and there seems to be so little time to fit it all in……. A small thrill here – I used some of the extra wool wash soap for delicates that I had discovered during Day Three of The Pack Rat Project (and this is exactly why things don’t get thrown out!!!). It was amazing to see how many of these scarves were not colorfast. Indeed it was expected that some of the ones from India were going to bleed a bit. But in actuality, just about all of them did. At least I hope it was the dye running and not just plain dirt. Each time I filled the sink, the water would turn color. This was repeated over and over again. 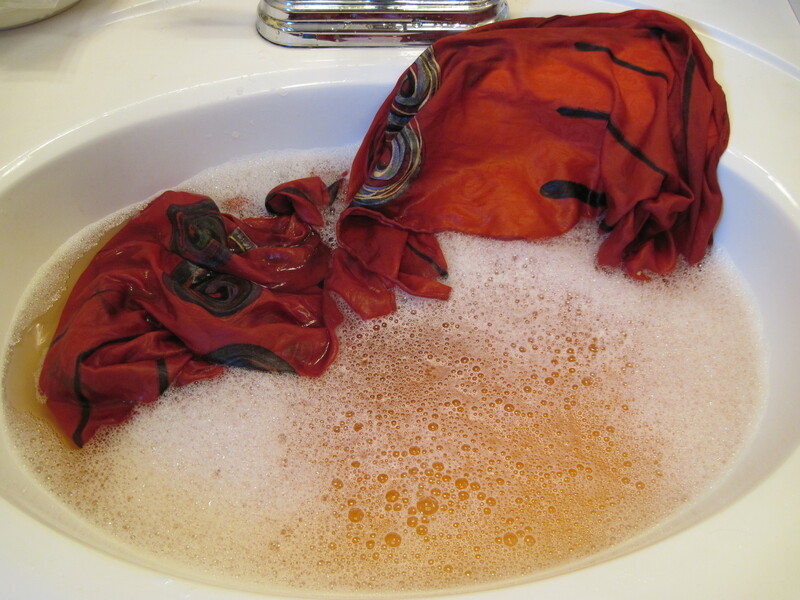 After washing the age and mustiness – the aura – that had been clinging to each scarf, they were carefully hung to dry – draped over the bannister above the stairs, hung over the porch railing outside the front door, laid across a wooden clothes dryer set in the hallway, hanging there like so many colorful Tibetan flags – I could not help but think of them as prayer flags for my father. This entry was posted in Uncategorized and tagged cleaning up, clearing out, collecting, drawers, Family, father, flags, Memories, Pack Rat Project; pack rat, reflection, scarves, time passing. Bookmark the permalink. It sounds like the makings of a quilt.